The truth about cats & dogs | Will My Dog Hate Me? Or at least the truth about one cat, Luna, and one dog, Frankie. It’s the love that dare not speak its name, an interspecies romance. 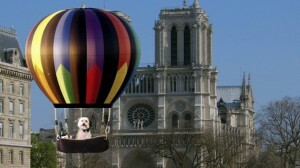 Yes, Frankie’s latest adventure in selling AM I BORING MY DOG took him to Paris. He didn’t tell me precisely what he did there aside from bookselling, but I have evidence that wine was involved. I knew enough to cherchez la femme. Et voila and mon dieu (and that pretty much exhausts my high school French): une chatte! What exactly happened? Frankie’s not saying. In fact, he’s looking rather above it all, like he’s moving on. 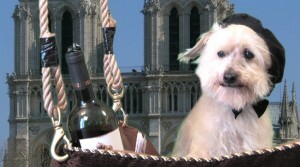 Check out his latest adventures on YouTube. 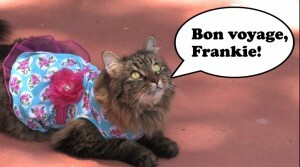 Incidentally, because of his newfound Gallic hauteur — not to mention his success with the ladies — Frankie decided not to pursue PeoplePets.com anymore. 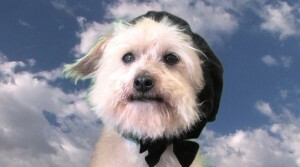 He now wants to hang with Francesca and Sharkey, Martha Stewart’s pups, and join them on the Daily Wag. What say you, Martha and pals? Frankie’s a very classy dog. 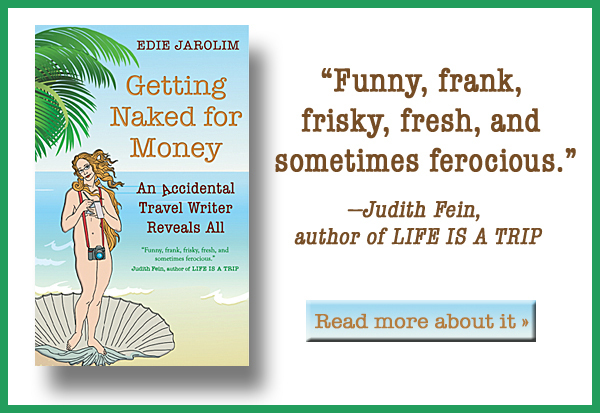 ← Traveling with your dog? Size counts.